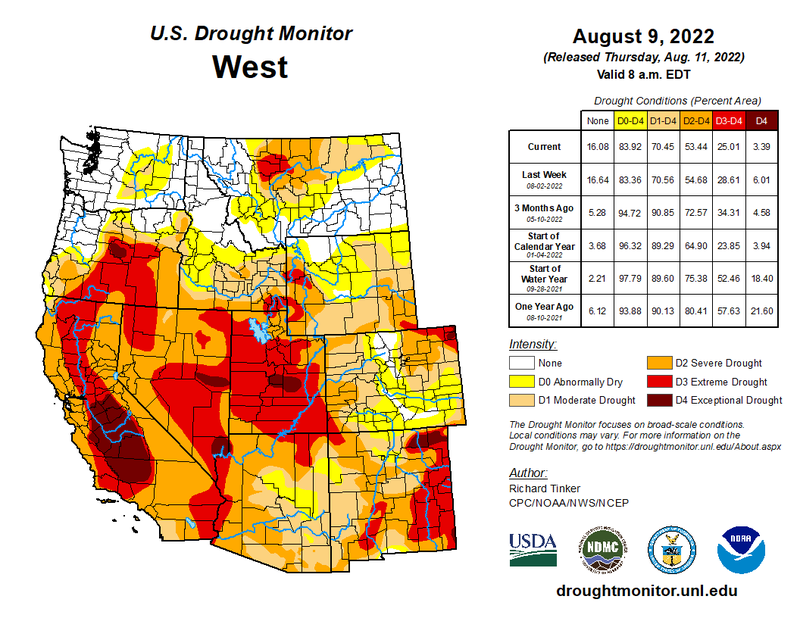 The US Drought Monitor is updated weekly and is a synthesis of multiple indices and impacts that represents a consensus of federal and academic scientists. 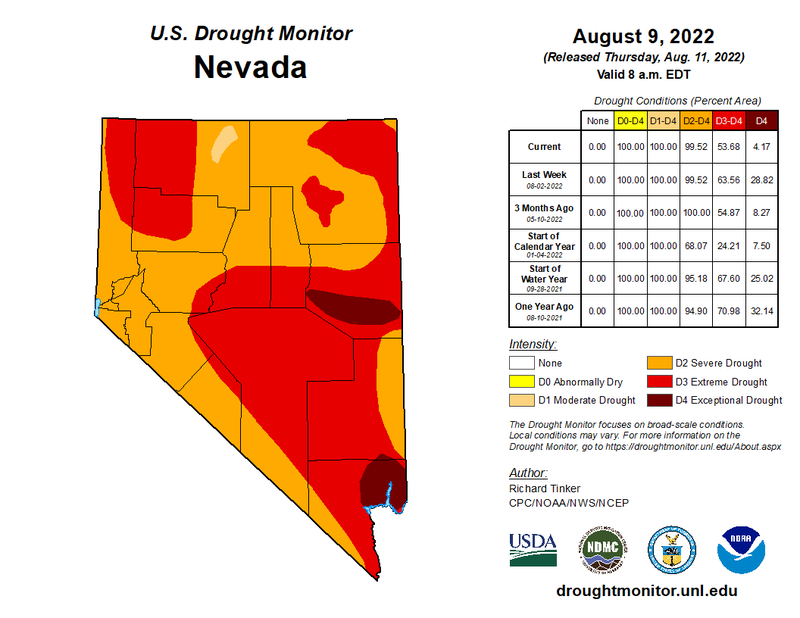 The US Drought Monitor is produced in partnership between the National Drought Mitigation Center at the University of Nebraska-Lincoln, the United States Department of Agriculture, and the National Oceanic and Atmospheric Administration. Map courtesy of NDMC-UNL. 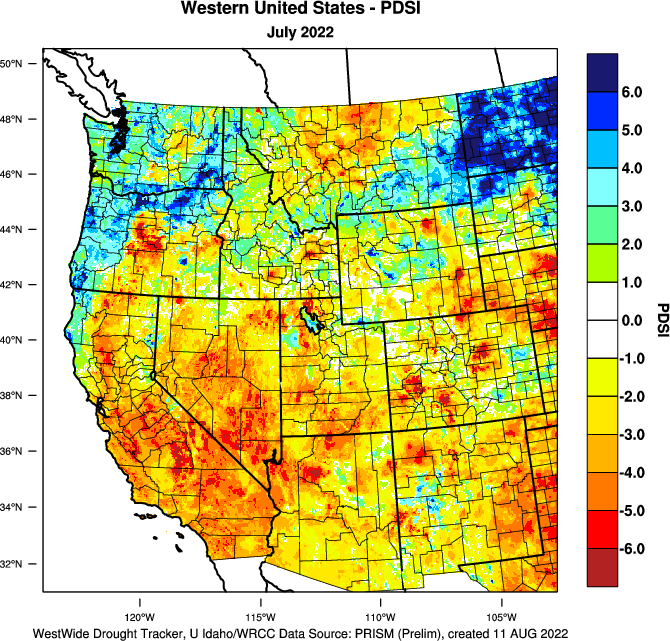 The Palmer Drought Severity Index (PDSI) map from the Westwide Drought Tracker is updated monthly. 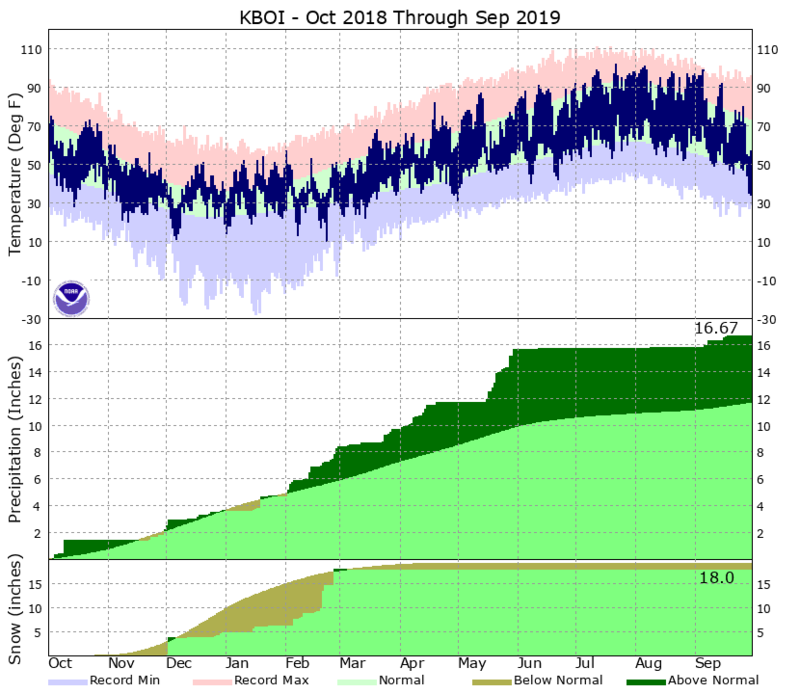 PDSI is based on a simplified water budget that considers temperature, precipitation, and soil moisture data to determine the accumulated water excess or deficit. 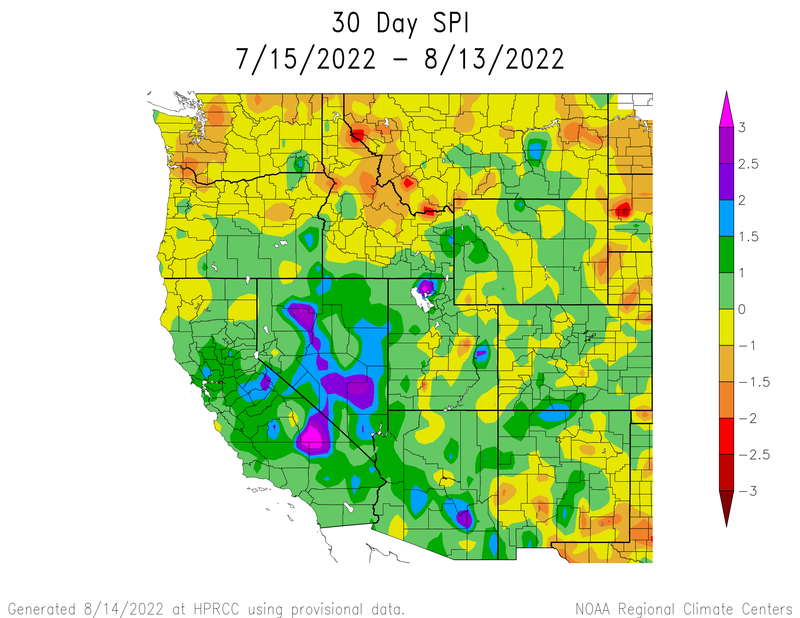 Negative values (yellow and red shades) show abnormal dryness to extreme drought. Positive values (shades of blue and green) indicate an excess of precipitation in an area. VegDRI is updated bi-weekly and is a depiction of vegetation stress across the contiguous United States. The index is calculated using fine resolution satellite data combined with climate and biophysical data. 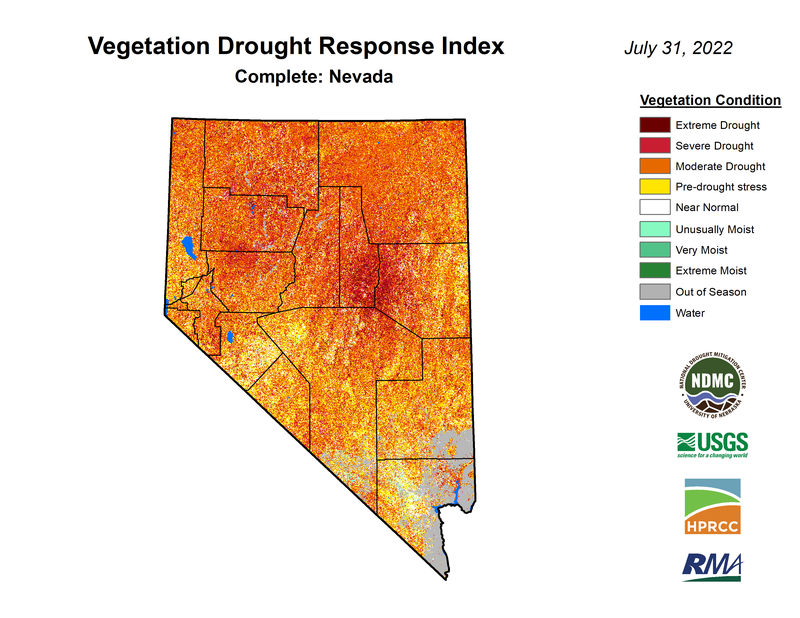 Multiple factors such as climate, pests, land use change, fire, and extreme weather events can influence vegetation conditions, so including climate and biophysical data helps distinguish stress due to drought. Departure from average greenness (DAG) maps are updated weekly using data from AVHRR satellite observations at a resolution of 1.1 km (0.6 mi). 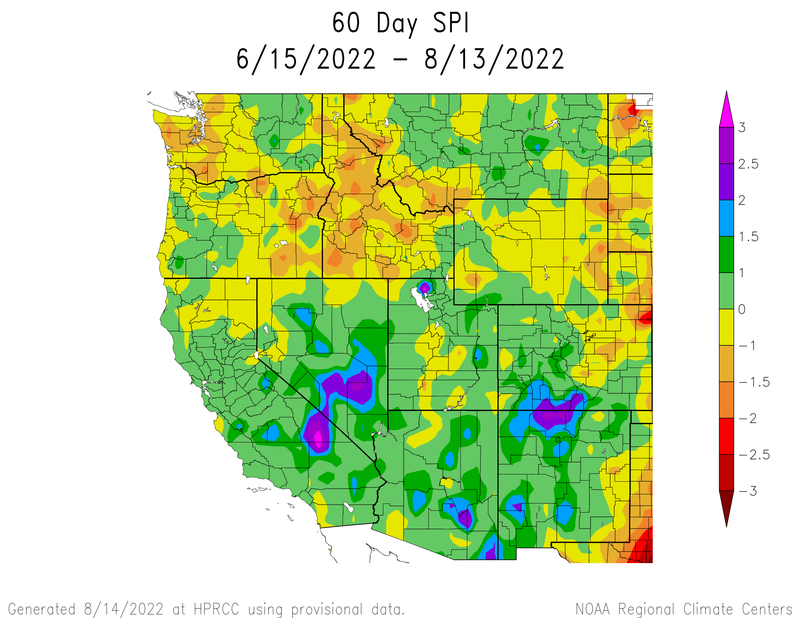 These maps portray how green each pixel of the image is compared to its average greenness for the current week of the year based on 1989-2003 data. Factors such as cloudiness, snow smoke, or haze can reduce the data quality. 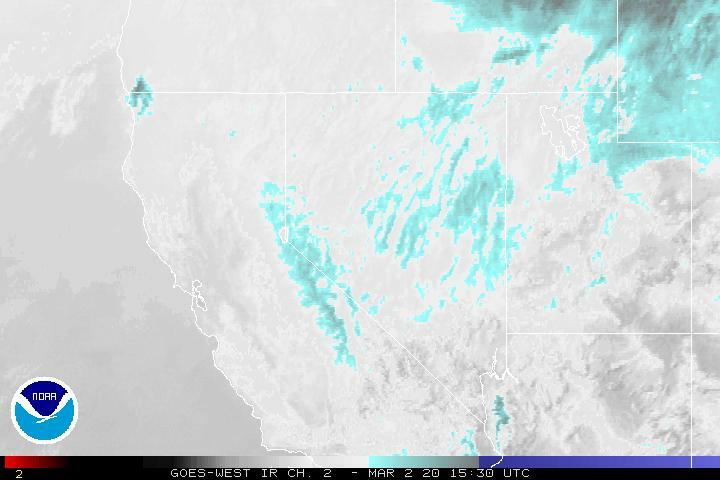 A mosaic of radar images from throughout the Southwest. Base reflectivity indicates the amount of energy reflected back to the radar by target objects, in this case, rain, hail, snow, or large cloud droplets. The amount of energy reflected back is an indicator of precipitation intensity, with yellow and red colors indicating more intense precipitation. Daily updated one-day weather forecast for the US created by NOAA based on results of several weather forecast models. 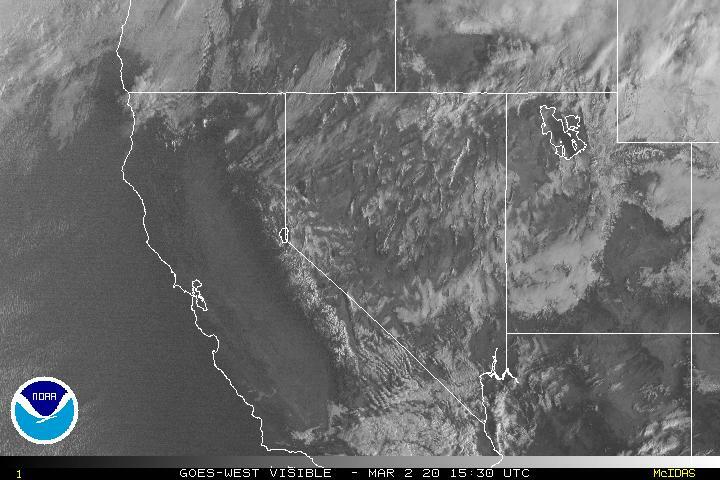 Updated every 30 minInfrared satellite images are used to observe cloud top temperature. Colder cloud tops (blue shades) are generally indicative of deeper clouds with lots of vertical motion that are likely to bring heavy precipitation if suffiecient moisture is present. Warmer cloud tops (white or grey) are generally lower or thinner clouds that are not likely to produce heavy precipitation. The relatively warm land surface appears as black. Warm desert areas sometimes appear in red. 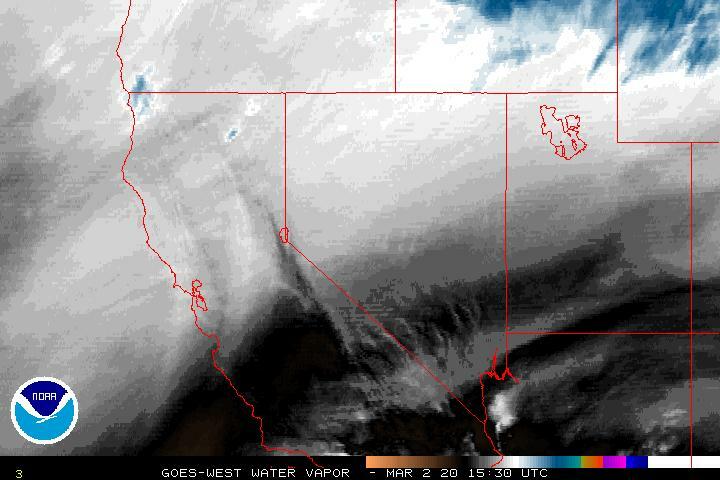 Updated every 30 min.Water vapor satellite images help to indicate the amount of moisture present in the atmosphere. Orange-brown shades indicate dry conditions while white and blue shades indicate higher amounts of water vapor. The presence of water vapor in the atmosphere is necessary for cloud formation and precipitation. Updated every 30 min.Visible satellite images are used for observing the locations and formations of clouds and storm systems. Since light in the visible portion of the spectrum is not present when the sun is down, these images are all black at night. Updated daily. Departure of average temperature from the 1981-2010 NCDC normal for the given time period. Updated daily. Percent of the 1981-2010 NCDC normal percipitation value at each station for the given time period. Updated daily. 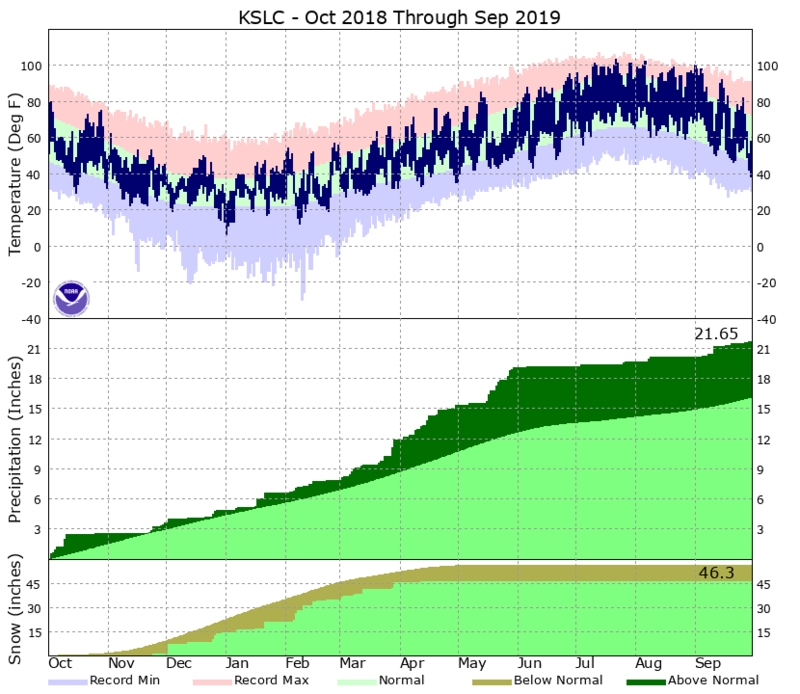 Station-based climate information for various locations in the Great Basin. Extreme high and low temperature records for a day of the year are indicated by the blue and red bars. The normal range is shown in green. 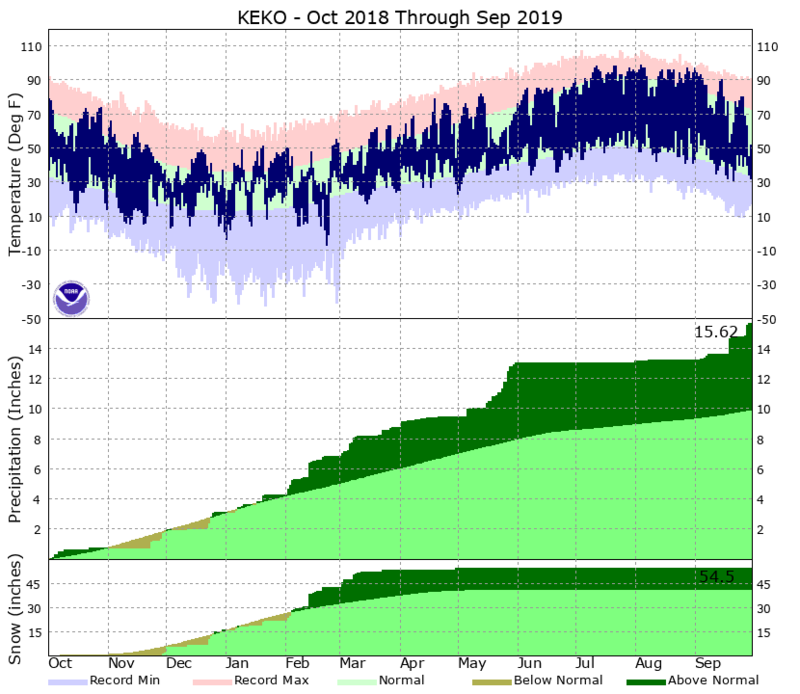 For precipitation, normal annual accumulations are shown in light green. 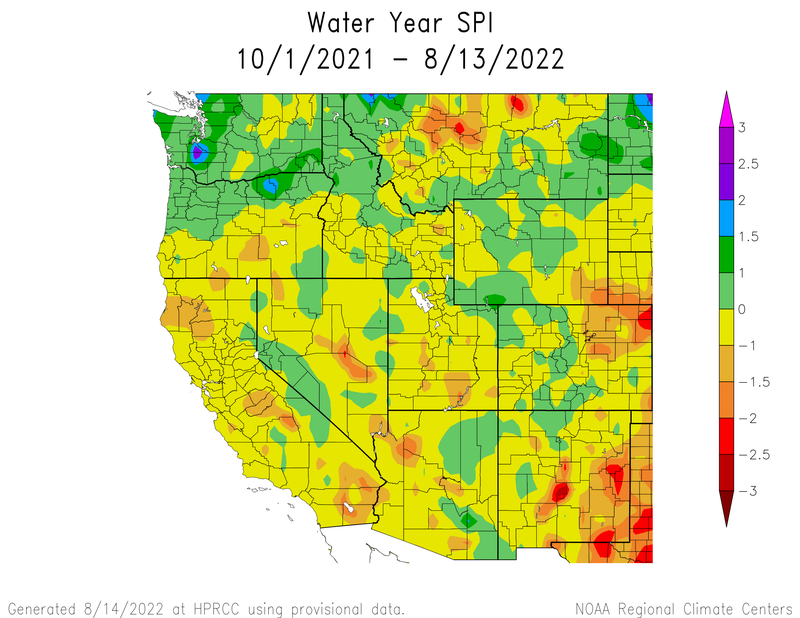 Actual water year-to-date precipitation is shown in mint green. The deficit between the two is shown in brown. Updated daily. Standardized Precipitation Index (SPI) is a probability index that considers only precipitation. 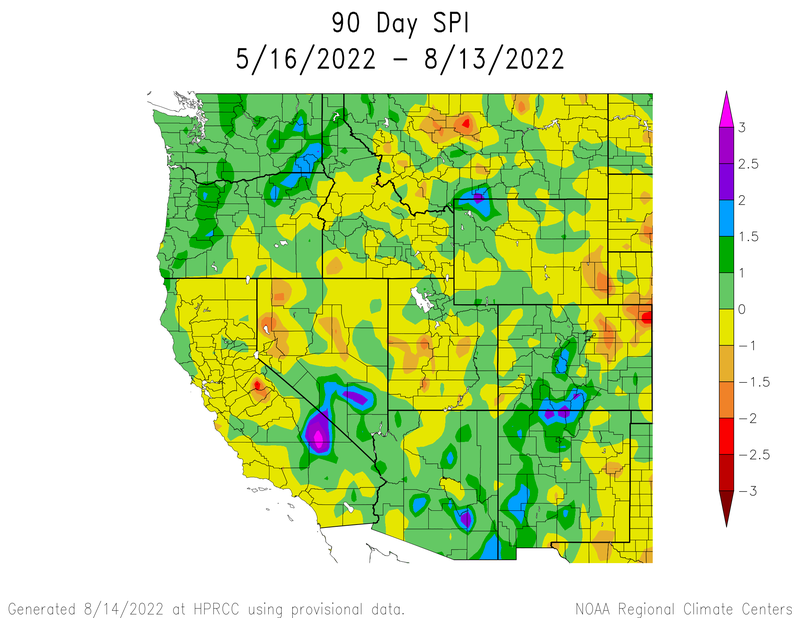 The SPI is an index based on the probability of recording a given amount of precipitation, and the probabilities are standardized so that an index of zero indicates the median precipitation amount (half of the historical precipitation amounts are below the median, and half are above the median). The index is negative for drought, and positive for wet conditions. Updated daily. Time series of snow water equivalent in inches for current water year, the past three water years, and the median of water years 1981-2010. Updated daily, and based on provisional SNOTEL data. Links: NRCS Snotel | What is SWE? Percent of 1981-2010 average precipitation by basin for the water year to date. Updated daily. Snow water equivalent (SWE) percent of normal by basin based on 1981-2010 average. 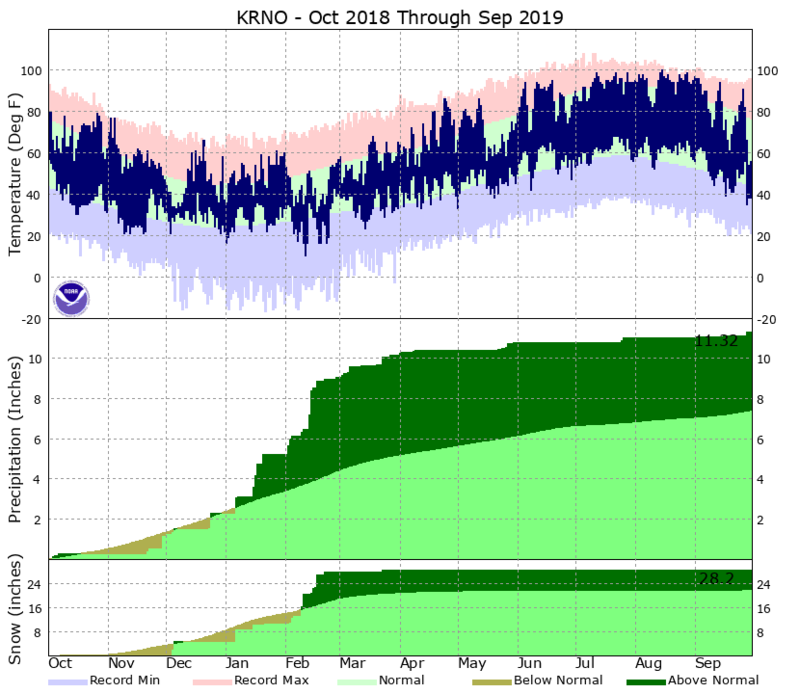 This product is updated daily with data from NRCS SNOTEL stations, and may not have data available in some locations in the summer and fall months. Precipitation percent of normal by basin based on 1981-2010 average. This product is updated daily with data from NRCS SNOTEL stations. Updated daily. 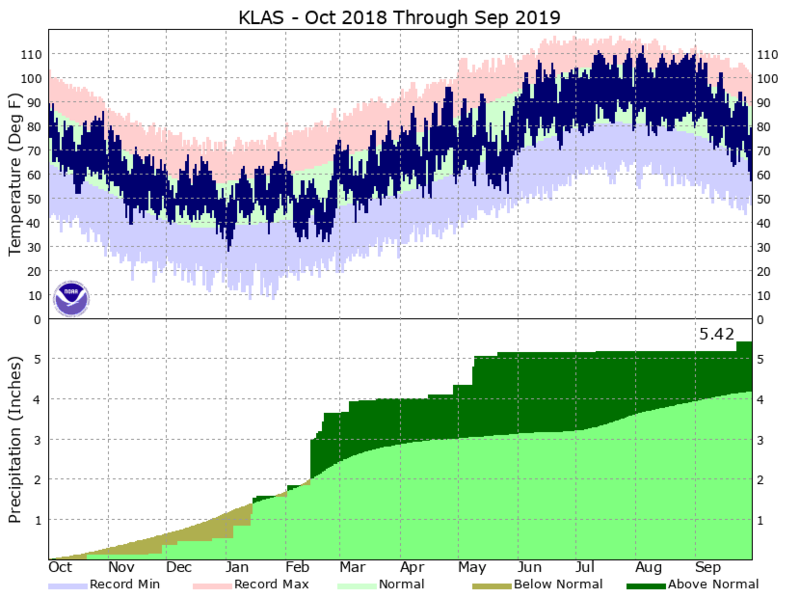 Cumulative precipitation for northern Sierra 8-Station Index for current water year, past two water years, average, two driest years and wettest year on record. Real time. 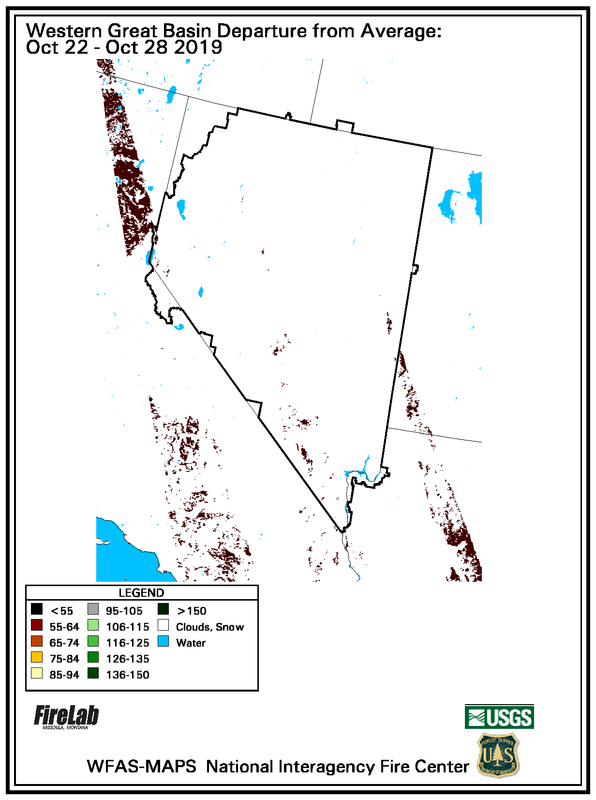 This map shows real-time stream flow in the Great Basin. Yellow to red shades represent below normal stream flow, with bright red less than 10th percentile. Green shows normal flow in the 25-75th percentile. Shades of blue indicate above normal, and black represents the highest flows, greater than 90th percentile. This real-time stream flow map is meant to highlight flood and high flow conditions. Updated daily. This map shows 7-day average stream flow in the Great Basin. Yellow to red shades represent below normal stream flow, with bright red less than 10th percentile. Green shows normal flow in the 25-75th percentile. Shades of blue indicate above normal, and black represents the highest flows, greater than 90th percentile. The 7-day stream flow map is used to highlight below-normal and drought conditions, rather than flood conditions. Updated daily. This map shows average stream flow for the past 28 days in the Great Basin. Yellow to red shades represent below normal stream flow, with bright red less than 10th percentile. Green shows normal flow in the 25-75th percentile. Shades of blue indicate above normal, and black represents the highest flows, greater than 90th percentile. The 28-day stream flow map is used to highlight below-normal and drought conditions, rather than flood conditions. Updated by 10th of each month. 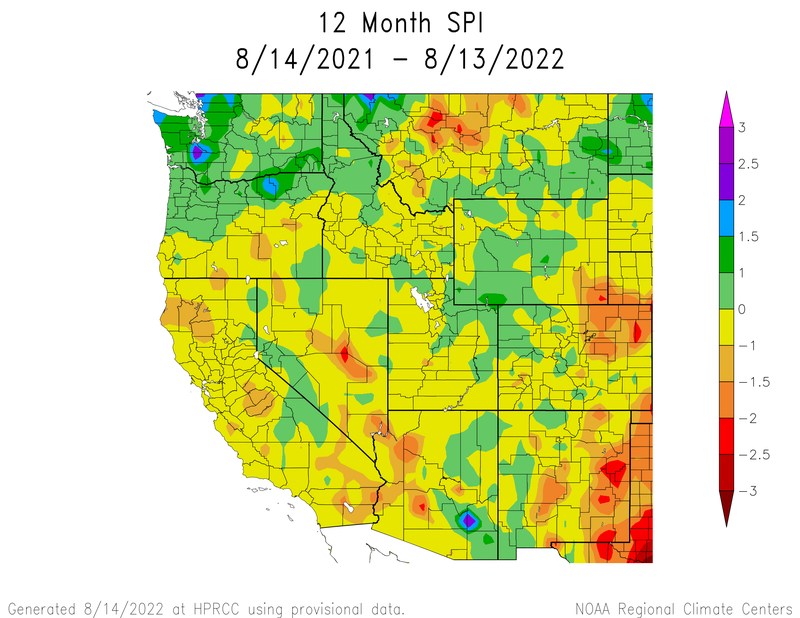 This graph from NRCS shows monthly reservoir storage as compared to capacity and average for states in the western US. The graph is updated each month January-May.